The engine of the Jowett Javelin/Jupiter, hereafter called the Jowett engine for convenience, is not a very complex one but it does call for a great deal of care in all aspects of reconditioning. There were a considerable number of engineering modifications during the production run of these engines – largely a result of the performance expected from these cars in competitive use. However, modern driving conditions are vastly different from the day to day driving conditions in the early fifties. For example, no motorways had been constructed and traffic jams were rarely encountered. The engine was designed to run on wartime "pool" petrol which was about 70 octane. So it is recommended that as far as possible engines should be restored to the standard set in production by 1953. This subject is fairly extensive and will be covered by two technical information leaflets. Leaflet No 3 deals with the components of the engine and its removal. Leaflet No 4 deals with inspection, modifications, and engine building. These technical notes do not replace the factory Maintenance Manual, List of Spare parts, or the Jowett Owners' Handbook, and it is desirable to consult these. However, sufficient information is contained in these notes to successfully rebuild an engine. The other sources are incomplete as guides for anyone not thoroughly familiar with the Jowett engine. Where part numbers are quoted they refer only to Item Numbers in the "List of Spare Parts", for Jowett Javelin and Jupiter, 1952 edition. Note, this document was updated in November 1993. Every attempt has been made to deal with this subject accurately and comprehensively but the responsibility for any matters connected with the use of these notes rests with the individual owner. The sole responsibility for deciding whether or not the guide is appropriate must be the owner's and in no circumstances can the Jowett Car Club (UK) or the authors be held responsible. 1.1. Phase 1. This shaft has almost rectangular webs (as viewed from the front of the engine). A shaft with oil holes in the crankpins pointing straight up the bores when the pistons are at the top of the stroke, is definitely Phase 1, but some Phase 1 shafts have the oil hole at an angle. The only crucial distinction is in the angle where the crankpin meets the web. If the radius of this angle is less than 0.100", this is likely to be a Phase 1. 1.2. Phase 1 crankshafts should never be used, no matter how good they look. If in doubt find another shaft. These shafts ..are liable to fracture. NOTE: Early Phase 1 crankshafts were not hardened. From Engine Number E0/PB.8902 the crankshaft was hardened at the bearing journals. 1.3. Figures stamped into the webs of all shafts may indicate the undersize of the crankpins. Numbers like R50647/10/20/0 would show the factory reconditioned crankshaft part number (R50647); the connecting rod journals are reground 0.010” undersize; the main bearing journals 0.020” undersize; and the final "0" indicates that the connecting rod crankpin width has been increased by 0.025”. But beware, it is probable that these figures will be misleading because regrinds will have been carried out by a variety of firms who may not have altered the stamped numbers. NOTE: The crankshaft that has been hardened at the journals is known as the Phase 2 crankshaft. 1.4. Crankshaft introduced at Engine Number E2/PD/22190 (and a few earlier ones) is sometimes called the Phase 3, or "high limit" shaft. This shaft is broadly similar in outline appearance to the Phase 1, but incorporates some or all of a crucial series of modifications. NOTE: The only sure indication of a high limit shaft is the crankpin radii referred to at 1.1. above. This must never be less than 0.100". If a shaft is taken for regrinding it must be pointed out that this radius must not be reduced, otherwise the crankshaft is virtually ruined. 1.5. The oil drillings in the crankpins were introduced at Engine Number E0/PB/8902 in the "trailing" position, as mentioned in 1.1. 1.6. 15/16" diameter holes are drilled longitudinally through the crankpins to reduce the off-centre weight of the shaft. 1.7. Although it will not be possible to detect easily, the hardening process was modified from that used on the Phase 1 and 2 crankshafts, and the machining quality was improved. NOTE: It is understood that all Phase 1 and 2 crankshafts were machined from solid steel billet. They were machined all over. 1.8. This shaft was a result of consultation with de Havilland's and was extensively tested. There is no positive reason to think that this shaft is defective for any normal purpose but opinions and personal experiences differ. 1.9. The black-sided shaft. This was probably introduced after 1953 and the end of car production. It is essentially a high-limit shaft as described above, the webs have been strengthened somewhat by leaving the edges rough forged – hence the term "black". NOTE: It is understood that the ‘black’ sided crankshafts were machined from a forging. 1.10. This shaft was fitted to some engines until Jowett Engineering ceased trading in 1963. It was, therefore, regarded as sound for all normal use. 1.11. The oval-web shaft. This is quite different in appearance from the other shafts. Viewed end-on the webs are elliptical in shape. This is the Phase 4 crankshaft. 1.12. This crankshaft exists in two forms. Early shafts are made from a forged steel which cannot be nitrided. later ones would be nitrided at time of manufacture. 1.13. A date stamp can be found on the webs of almost all oval-web crankshafts. All shafts dated after Sept. 1958 (9/58) are understood to be nitrideable. NOTE: This dateline is now considered uncertain and some earlier shafts may also take nitriding. Laystalls are able to advise on this matter when reconditioning an oval-web crank-shaft. 1.14. Oval web shafts, if not nitrided, can wear rather rapidly especially if fitted with copper-lead bearings. Some see this as a disadvantage of the shaft. NOTE: An un-nitrided Laystall should run with good wear characteristics in aluminium-tin bearings, assuming good quality engine oil is used. 1.15. Making a choice of crankshaft, if there is one, probably indicates an oval-web as first choice. For competitive driving the oval web should always be the choice. 1.16. For normal driving the black sided shaft should be perfectly satisfactory and the high limit (Series Ill) adequate. The Phase I shaft is not useable. 1.17. It should be noted that crankshaft breakage was far more frequent on all makes of cars built before 1950, than on current motor vehicles. The oval-web is not immune from breakage. It is also worthy of comment that the Jowett engineers always felt that the fault lay in the flexibility of the crankcase rather than the shaft itself. IMPORTANT NOTE: And it can not be stressed strongly enough – any Jowett crankshaft that has had the journal corner radii reduced from the specified 0.100” radius, will break, whether it is a Phase 4 crankshaft or not. 2.0. For competition use Jowett Cars Limited (JCL) reduced flywheel weight drastically. An increasing number of owners are now finding that flywheel weight can be reduced to advantage and flywheels which have been machined to reduce weight may be encountered. Grooves on the engine side of the flywheel is the most likely evidence. It is most important to ensure that lightened flywheels are checked for balance. 2.1. The starter ring gear (494) was shrunk on to the flywheel, but they are frequently found to move with use. Various forms of anchorage are found including welding. JCL tapped the edge of the flywheel and fitted countersink screws. These should never cut into the ring gear itself, but simply catch the edge. 3.1. It was intended to produce the crankcase by the die-casting method which was a relatively new process. Before this could be arranged a number of sand-cast crankcases were made. If the crankcase is compared with the parts lists it will be found that the details of the drawings in the list are those of the sand casting. The principal features of this case type are, a rough pebbly finish; the shape of the front of the nearside bank is a simplified shape compared with later ones, and the flange around the bottom of the crankcase abutting the sump is on the outside of the case and not inside as later. There are a number of other .detail differences not especially relevant and other points will be referred to as appropriate. These crankcases are much heavier than the die castings and have much to commend them. 3.2. The Phase 1 crankcase is the basic die casting substantially the same as the crankcase described in 3.1 apart from detail changes, presumably for casting purposes, and having no mechanical significance. 3.3. Modifications to the Phase 1 crankcase were .introduced gradually, and sometimes crankcases with these modifications are stamped with a large ‘2’ – hence they are referred to as Phase 2. However, this group of crankcases was simply ‘transitional’ as the design of the ‘Series III’ crankcases was underway, incorporating the modifications being introduced piecemeal in the Phase 2 crankcases. An example is that engines after E1/PC/16744 have an oil groove machined round the centre main bearing housing – to allow oil to flow behind the bearing shells and enter the bearing at two points, but not until almost a year later, was a similar groove machined round the rear main. NOTE: It is understood that JCL machined oil path grooves in the main bearing supports when earlier crankcases were being reconditioned by the works. a) Webs are cast-in radiating from the main bearing supports. b) All main bearing housings have the machined oil path groove. c) The, 5/16" oil way from the oil delivery pipe from the pump to the filter housing in the crankcase was subject to two stages of modification on Series III crankcases. The first was to bore a shallow 9/16" depression on the top face of the crankcase in the oil delivery hole. The intention here might have been to avoid restricting the flow by the expansion of the gasket or by gasket cement. On much later engine it is found that the delivery hole itself from the union at the front to the top face has been increased in diameter to 9/16". This modification cannot be unequivocally recommended since it seriously increases the risk of gasket failure (313). 3.5. In the late stages of production, probably mid 1953, some crankcases were made to accommodate a special cylinder liner using a synthetic rubber seal. These crankcases have a chamfer at the edge of the liner seating and the ring is trapped between this and a radius on the flange of the liner. The liner is then in metal to metal contact with the crankcase. 3.6. After production ceased and the supply of crankcases ran out, a new series of sand cast crankcases was introduced. These are rare but are substantially similar to the Series III pattern although they are heavier castings. 3.7 Odd-half crankcase sets. In order to use up crankcases where one half was defective, half cases from different sets were paired. This involved re-machining the main bearing supports and the camshaft bearing bores. They are fitted with thicker main bearing shells. These shells are no longer available, however Ford 302 ci Windsor main bearing shells can be used, provided the crankshaft is ground accordingly. These shells are narrow and are located by tangs rather than dowels. There are no suitable bearings for these crankcases readily available. These crankcases are often denoted by numbers with two letter prefixes. NOTE: It is unlikely that odd halves of crankcases can be paired since the main bearing housings are not centred sufficiently accurately in the crankcase, hence re-machining is required. However, it does happen and odd halves should not be discarded without consideration. NOTE: There were also instances where one sump flange was built up with weld and machined flush with the sump face on the ‘higher’ half. 3.8. After hydraulic tappets were abandoned a change was made in the location of the oil galleries which lubricate the tappets (215) (or cam followers). A hole can be felt in the tappet bore which will either be about 1/16" diameter or else about 1/4". The former indicates that the case was designed for solid tappets, the latter for hydraulics. 3.9. The position of these holes is not identical. 3.10. Hydraulic tappets can not operate in a crankcase designed for solid tappets (with the small oil feed hole). Solid tappets can be fitted to a hydraulic tappet crankcase but there may be high oil spillage from the bores which could show as low oil pressure at low-idle engine speed, especially when the engine is hot. 3.11. Series III crankcases were sometimes manufactured for hydraulic tappets. Crankcases before about engine number 11,500 were always for hydraulic tappets. 4.1. The standard piston (compression ratio on 1951 passenger car 7.2:1) has a concave head with a level rim approximately 5/16" wide. 4.2. The high compression pistons (C.R. 7.6:1 & 8:1) usually fitted on competition engines and Jupiter engines. These have a smaller concavity in the crown. 4.3. The flat-topped piston (C.R. 9.25:1) for competitive use, but not common. These pistons have a solid skirt unlike those above which have a longitudinal slit in the skirt. NOTE: Compression ratios are also dependent on the cylinder head capacity, including the type of gasket fitted. 4.4. During production a number of manufacturers (Repco, Polson and JP Engineering Products) produced variations on the standard Hepworth & Grandage ‘Hepolite’ piston style. It is not now possible to list all these variations but one still found occasionally has two scraper rings leafier rings in all instead of three. 4.6. The Triumph 1300 piston (Part No. 20140 from Associated. Engineering Sales catalogue) has been widely used, apparently satisfactorily. However, these pistons require machining of the skirt to clear the crankshaft, and to increase the distance between the gudgeon pin bosses. This machining is best left to specialist workshops. 4.7. The Triumph piston requires the liners to be re-bored to fit that piston as it is not the same diameter as a norma1 Hepolite piston. 4.9. A comparison of these pistons can be found in Appendix I. 4.10. The Hepo1ite piston as originally fitted to the Jowett engine has three rings. The top two are compression rings and the third ring is an oil control ring. 4.11. The top, Vacrom, ring (205) is 3/32" thick and is chrome plated. It is marked ‘top’ on the side that is fitted uppermost. The surface is tapered. 4.12. The second ring (204) is internally stepped and the ring must be installed with the step to the piston crown. 4.13. The oil scraper ring (203) is a single 5/32" ring with circumferential slits. later oil control rings have a chamfer on the upper edge of the ring. 4.14. Various forms of oil control rings will be found on old engines e.g. ’Oil master’ and ‘Cord’, or ‘Wellworthy’. These were much used in the 1950s and 1960s but are now not generally available. Some required machining of the ring grooves. These are usually made up of several separate rings (segmented) intended to expand against the cylinder wall and the ring grooves. JCL did not recommend the use of most of these rings as they caused rapid liner wear, especially ‘Cord’ ring sets. NOTE: Re-machining the piston ring grooves encouraged the practice of ‘piston head separation’. 4.15. Hepolite oil control rings were supplied with a polygonal spring ring to fit behind the standard ring if installed into worn bores. Whether or not this is fitted is a matter of choice. 4.16. The split in the skirt of the standard Hepolite piston (not the flat-topped) allows the piston to operate more quietly. Solid skirt pistons tend to clatter slightly. It is not unknown for owners to mistakenly think the split is a break! NOTE: Split skirt pistons are stamped ‘FRONT’ on the crown above one of the gudgeon pin bores. The split skirt faces the underside on the LHS and towards the top on the RHS of the engine. 4.17. In restoring an engine the choice of piston is often a matter of availability. There are few, if any, sets of old stock pistons on the market. Triumph pistons, as yet, are readily available but have one definite defect in that they require quite substantial modification which is always undesirable, even though they have been in use for some years without any known serious problems. On the other hand, some feel they have a slightly adverse effect on the engine and they are more noisy probably because they are shorter in the skirt. The Hepworth replica pistons were, of course, supplied by a member of the Hepworth family who made Hepolite pistons. There have so far been no reports of their long term use, but nevertheless, they seem the piston of choice if they become available again. Higher compression pistons are a matter of choice, mostly for competition use. The flat-topped pistons should be regarded as only suited to experimental and competition engines, their value may be very limited. VW pistons cannot be recommended. This will be considered further under engine assembly. 5.0. There are five types of liner. These are of the wet liner type and are a push fit in the crankcase. They are held in place by the pressure of the cylinder head and a locating plate, or a support casting centred on the head stud situated between each pair of liners. 5.1. The earliest liners in use up to about Engine Number 8825 (1950), are rather thin in the water jacket wall. For this reason they are believed to be liable to be porous if rebored. They should not be rebored, therefore, unless absolutely necessary. NOTE: If thin-walled cylinder liners are bored out, they will crush (give) under the pressure applied by the cylinder head securing nuts. In addition, the thinner wall will vibrate with combustion forces and piston direction change, and will then cause what is known as ‘cavitation erosion’. This is a condition where tiny air bubbles in the coolant implode against the cylinder liner wall, thus eroding the metal away. 5.2. After the above liner, a similar one was introduced with a thickened water jacket. This will certainly take rebores up to 0.040” oversize, and perhaps beyond. 5.3. It is difficult to distinguish between these two liners but comparing them side by side they are in fact clearly different. Whilst the diameter of the water jacket area is different the lip flange diameter remains the same and, hence, the flanges look more stubby. The outside diameter of the later liner barrel is 3.375” (85.73 mm) but this is often difficult to measure because of ,the surface rusting of used liners. 5.4. The cylinder liners described 5.1 and 5.2 have a shallow groove round the liner skirt, apparently intended to take the edge of the Hallite liner seal. 5.5. As mentioned in 3.5 the adoption on of an ‘O’ ring seal between the cylinder liner and the crankcase, meant a change in the liner design. The ‘O’ ring liner is longer from top to bottom flanges. It has a radius (curve) under the lower flange which goes into the chamfer in the crankcase seating. NOTE: ‘O’ ring liners cannot be used in a standard crankcase, without modification, nor can standard liners be used in an ‘O’ ring type crankcase. 5.6. Very late in production, the cylinder head gasket was altered. The joint between the liner and the head was made with a Wills ring. These are nitrogen filled mild steel rings 3.5" diameter and 3/32" cross section. The ‘O’ ring cylinder liner was modified by machining a location groove in the top flange of the liner for the Wills ring. The gasket around the edge of the crankcase was of laminated aluminium, with layers being peeled off to install. 5.7. A very small number of other experimental liners have appeared, in particular the 3" liners with an aluminium water jacket. It is most unlikely any of these experimental liners will be encountered in an engine. Hepworth and Grandage who manufactured the liners did not regard even the ‘O’ ring liners as other than experimental. 6.0. JCL experimented with a wide range of materials to prevent the liners sinking and the head gasket seal failing. This represents a weakness in the engine design which will continue to be encountered as long as a form of compressible gasket is used..
6.2. The plain Hallite ring was used almost to the end of production and, therefore, served quite well. However, in current usage where the engine stands over winter without water they may be more fallible. 6.3. In 1953 Hallite was replaced by Klingerit. Superficially this appears similar, but is composed of CAF bonded together with a bronze mesh. 6.4. The Klingerit seals are usua1ly distinguishable, since the name is printed on the material from which the rings are stamped. A more sure guide is to run a finger lightly round the edge of the ring and the fine bronze wires will be felt. 6.5. As mentioned at 3.6 and 5.5, redesign of the liner and crankcase at the very end of production, used a synthetic ‘O’ ring. This can only be used with the appropriate liners and crankcase set. 6.6. The rubber ‘O’ ring is a very narrow cross-section ring, approximately 1 mm diameter. At present there is no known source of supply. It has been recommended that these rings can be simply replaced by modern silicone gasket sealant, but although this is being tested, its long term viability is unknown. 6.7. JCL tested but discarded various metal rings including aluminium and copper. Nevertheless soft copper rings have been used entirely successfully by JCC (UK) members over the past twenty years or more. 6.8. Copper rings can be re-used. 6.9. It is important that copper rings should be softened. This simply done by heating to redness in a household gas flame and plunging into cold water. The copper spacer rings wilt harden with age and use. 6.10. The choice of liner seal for the non-‘O’ ring type of crankcase depends on the skill of the owner. The Hallite and Klingerit seals are more compressible and are some insurance against damage to the crankcase when tightening cylinder heads down. Hence, for the beginner it is recommended that Klingerit seals be used. 6.11. The cylinder liners must be set accurately to project beyond the crankcase (known as the ‘cylinder liner protrusion’. This protrusion differs for the different liner seals. The cylinder liner protrusion is determined by fitting thin copper shims. With copper-asbestos-steel cylinder head gaskets (Jupiter) the interference should be close to the lower tolerance. 7.0. The engine has eight replaceable bearings and three non-replaceable bearings. 7.1. The three non-replaceable bearings are those machined in the crankcase for the camshaft. Apart from the possibility of gross damage these rarely require any attention. NOTE: Due to age and amount of use, the centre camshaft bearing bore does wear. Now there is the facility to bore the crankcase set 0.015” oversize and install a camshaft with 0.015” larger bearings. 7.2. The crankshaft spigot bearing (152) is an ‘Oilite’ (Shorelube) bush which is a firm push fit in the rear of the crankshaft, and carries the spigot of the gearbox clutch shaft (590). 7.3. ‘Oilite’ bushes are never reamed out and require soaking in oil for twenty-four hours before pressing in with a sized mandrel. 7.4. The remaining bearings are the four big end bearings (197) and the three main bearings (150). These are all shell bearings. 7.5. All Jowett crankshaft bearings are steel backed and use either white-metal or copper-lead bearings have a layer of copper-lead which is bronze in colour. This is coated with a thin layer of indium which is silvery. They are not easily distinguished from white-metal when new but show coppery patches when worn. Substitute bearings of aluminium or tin based alloys may be in use but no report on their suitability is available. 7.7. The fatigue limit of a white-metal big end bearing in the Jowett engine is theoretically 5,800 engine rpm, compared with 6,800 engine rpm for the copper-lead. 7.8. The rear main bearing remained white-metal throughout. This was probably due to the cost of producing a similar bearing in copper-lead. It is possible to have a copper-lead rear main fitted, with separate thrust flanges. This involves machining the crankcase. JCL fitted such bearings to the over-bored ‘odd-half’ crankcases, but though these bearings were listed as Jowett parts many years ago, they are not available as such now. 7.9. Failure of the rear main is not due to overheating or lack of lubrication as is often assumed, but due to fatigue. 7.10. Both white-metal and copper-lead bearings are available. The choice depends upon the hardness of the crankshaft. If the shaft is hardened copper-lead bearings are required but an unhardened crankshaft will wear more rapidly with them. 7.11. The pattern of big end bearings varied during production. 7.12. The major change was the adoption of narrow (1/8") locking notches replacing the 1/4" wide notches which are pressed out on the joining edge of each bearing and locate in the corresponding grooves in the connecting rod and cap (192). 7.13. The reason for this change was given as the need to avoid the increased radii (see 1.4). Strictly speaking only the narrow notch bearings and the appropriate con rods should be fitted to high-limit, black-sided and oval-web crankshafts. 7.14. From Engine Number E1/PC/17402 a hole was drilled in the connecting rod bearing 1/4 " diameter. This was to line up with a 1/16" hole in the connecting rod cap to act as a sludge release hole. At Engine Number 20977, the hole in the cap was changed to a simple recess. At Engine Number 22451 the hole in the bearing and the recess were discontinued. 7.15. Big end bearings with the sludge release hole can be used but preferably not fitted in line with any hole or recess in the cap. The arrangement tended to produce flutter in the oi1 pressure. This flutter is not critical if it occurs but appears as a trembling of the oil pressure gauge indicator needle at low idle. 7.16. As bearings become less plentiful, the early bearings may have to be used with the later crankshafts. In practice this never seems to create problems, but the fit of the bearing should be checked carefully on assembly. 7.17. A more difficult problem arises concerning the running clearances of the crankshaft bearings. It is quite clear that according to the dimensions given in the JCL literature it is possible for main bearings to be an interference fit on the journals. That is to say the bearings are very slightly smaller than the journal and actually grip it with a metal to metal contact. The Motor Trader Data Sheet confirms this but with the comment, that "This theoretical interference becomes a positive clearance under running conditions". 7.18. This problem is further complicated by an effective increase in journal diameter in the high limit crankshafts. It seems very likely that fitting an early main bearing to one of these later shafts could lock it solid. 7.19. There is no question but that an actual interference fit in this way is entirely contrary to all mechanical principles. It is also found that some rebuilt Jowett engines are exceedingly difficult to turn over at first. This always seems to have been the case and after a little running the problem disappears and bearing failure does not seem to result. 7.20. Under no circumstances should the bearing surface of a shell bearing be scraped to fit. 7.22 A nitrided oval-web shaft requires a Copper-lead bearing These are those of Vandervell manufacture and this set-up should be standard for a hard driven car. However, copper- lead has deficiencies. The actual bearing metal is the very thin layer of indium on the surface of the bearing. If this is worn away the underlying metal is highly susceptible to corrosion. Thus impurities such as grit and dirt in the oil will damage these bearings. The relatively hard lead bronze does not allow grit to embed in the. bearing and hence it remains to wear the shaft itself. For these reasons engines with copper-lead bearings must be kept exceptionally clean. 7.23. White-metal, as the original Jowett bearings, is a much softer metal but has a good deal to commend it. It can absorb foreign particles .well; it is naturally ‘slippy’ and less inclined to seize; it. tends to ‘flow’ to a degree and adapt to circumstances; and it is not overly prone to corrosion. Its main deficiency is its relatively low fatigue strength. Thin steel backed bearings are, incidentally, much stronger than the thick cast-in white-metal bearings in the pre-war cars and should not be judged by that standard. 7.24. Bearing metals have developed a good deal since 1953 and it could be that reticula tin or aluminium silicon bearings will become available and will be very suitable for fitment to the nitrided oval-web crankshaft. 7.25. ­At this time (November 1993) a problem exists concerning crankshaft bearings. Whilst many are available either as white metal or copper-lead of the original Jowett pattern, some are very scarce. If a suitable bearing is unobtainable it will be necessary to turn to substitute bearings. 7.26. One substitute bearing has come into use recently, the Hillman Avenger big end bearing. No problems are known to have occurred with its use, but, of course, experience is limited so far. The relevant data can be found in Appendix II. 7.27. The data figures indicate that the crankshaft will need to be ground to Hillman Avenger dimensions, although the bearings may well be adequate fitted to a part worn shaft. This would be needed to be discussed with the firm undertaking the re-grind. NOTE: It has been found best to grind the crankshaft to the dimension of the bearing clamped in the connecting rod. 7.28. The values for the outside diameter indicate that the Avenger bearings are 0.0015” to 0.0020” larger diameter than the Jowett i.e. 0.0047” to 0.0063” longer, this being added to the "crush" when fitted into the Jowett connecting rod. 7.29. To check the crush, the bearing shells and the connecting rod bores should be carefully cleaned and assembled. The connecting rod cap should be tightened down, equally, with both bolts finger tight so that the ends of the bearing are secured firmly together. The crush can then be measured with a feeler gauge between the faces of the connecting rod and cap. This should not exceed about 0.002” or 0.003”, but this is a matter of judgement. It should be added that this measurement is not easy with the Jowett connecting rod. 7.30. If judged satisfactory the caps should be tightened down until the cap and connecting rod faces meet. If they do not do so well below the assembly torque level the degree of crush is clearly quite unacceptable. 7.31. Investigations of this problem have shown that a slight distortion of the Avenger bearing does occur when the cap is torqued down. This is of the order of 0.0004” reduction in diameter at the point where the bearings abut. Opinion is that this is not sufficiently large to be of concern and indeed these bearings have been fitted for some time without problems being reported. It may be that the owner will accept this view. NOTE: It should be borne in mind that many Jowett engine connecting rods have stretched bearing bores. A simple method of checking for stretched bores is to note how tight the Jowett bearing shell is to remove from the rod and cap. If the shells are easy to push out or, indeed, if they fall out, the connecting rod bore is stretched. For this condition, the Hillman Avenger bearing works in the Jowett engine’s favour. If the bore in the connecting rod is too tight, the bore can be lightly honed. 7.32. The most ‘correct’ way to deal with this from an engineering point of view is to have the eye of the connecting rod ground out slightly to accept the substitute bearing. This would in any event rectify any distortion of the eye of the connecting rod at the same time. On the other hand it might be objected that the connecting rod would then not accept Jowett bearings should they become available. However, it should be pointed out that the Avenger sized bearing is used on many cars and is likely to remain available for a good number of years. Jowett bearings are unlikely to be re-manufactured. 7.33. It would also be possible to ease the ends of the bearing shells by 0.001" from each end, but this would require a good deal of care. NOTE: This is not a recommended procedure with serrated caps. 7.34. The Avenger bearings are of reticular-tin-aluminium (Alu-tin). This material is suitable for hardened crankshafts including nitrided shafts if the journals are lapped to an appropriate finish. They are also less subject to wearing an unhardened shaft than the Jowett copper-lead, although more so than white-metal. 8.0. Investigation of unexpected cases of bearing failure led to variations in oil pump design. 8.1. There was a very early oil pump modification to increase output after about Engine Number 500. Examples of this are unlikely to be found and there is no clear record of the exact modification carried out but it may have been the fitting of slightly longer gears (167). NOTE: The very early oil pump featured a brass casting for the cover (178). This material allowed the oil pick-up filter to droop and wear the sump. The oil release spool (175) was found to be erratic after some wear. 8.2. Up to mid 1952, oil pumps had short bodies (as illustrated in the parts lists). The length of the pump body (165) was 3.875", not including lower cover (178). 8.3. After mid 1952 long bodied oil pumps were introduced. The intention being that they would be submerged in the engine oil and self priming. To facilitate this, the pump body length was increased to 4.5". 8.4. In what may have been a transitional form of submerged pump, the gears as for the short pump, were fitted in long bodied pumps. (Of course the pumps were specially machined to take the short gears.) These short gears are 0.810” long. The later gears are slightly longer and must not be confused. NOTE: Not sure about this, having only seen the one length of pump element gear. 8.5. Delivery pipes (172) are found in various forms. 8.6. With the long bodied pump the diameter of delivery pipes is. increased from 3/8" to 5/8" outside diameter. 8.7. The delivery pipe elbow held to the crankcase with two cap screws was changed, possibly as a result of re-positioning the oil galleries on the introduction of solid tappets. There are therefore, a number of different combinations of pipe and elbow. Generally, most later oil delivery pipes of large diameter cannot be fitted to early crankcases without finding the correct and probably rare type of pipe and elbow. 8.8. Pump base cover assy. varies in type of intake pipe and oil relief valve (175-7). 8.9. The early pump was fitted with a non-adjustable oil relief valve. This returned oil through a hole in the bottom of the base directly into the sump. It was found that this led to bad aeration of the oil. 8.10. The first attempt to cure this problem was the fitting of a short curved pipe to the base with the object of sending the oil across the surface of the sump .oi1. This proved entirely unsatisfactory. 8.11. With the submerged pump an adjustable relief valve was fitted and the oil relief valve discharged within the pump back into the intake pipe. The fitting of this type of pump base must be strongly recommended. 8.12. A variety of intake pipes are found. There are of course the early 3/8" pipes and the later 5/8" outside diameter pipes, the intake matching the output pipe. 8.13. The pipe angle differs but is governed by the need for clearance with the sump floor. Some filter housings have the tip turned down. In this case it should be checked that there is a clearance of at least 1/16" between the lip and the sump bottom. If there is no lip the filter should entirely not be less than 5/16" from the bottom of the sump. 8.14. The oil pump cover, mostly on early cars, is bronze and otherwise cast iron. Also associated pipes are sometimes copper and sometimes steel. There is no significance in these changes. NOTE: the purpose of the adjustable relief valve is to set .the oil pressure in a good engine. There is nothing to be gained by increasing the oil pressure to compensate for bearing wear. 9.0. The bronze gear fitted to the front crankshaft spigot is found in two forms. 9.1. Width of gear 1/2 ". 9.3. Width of gear 5/8"
9.4. It is not known when or why the increase in width was made but this gear is prone to wear and the wider gear is preferable. 10.0 The early sump baffle was made of aluminium but this occasionally broke up (notably in the Spa 24 hour race). 10.1. The later baffles were pressed steel. 10.2. Failure of either baffle is, in fact, not common. NOTE: Oil baffles have been found with loose leg bracket retaining rivets. 11.0. Two patterns of cam profile were used in the Jowett engine, a) for hydraulic tappets, b) for solid tappets. There is no evidence that special camshafts were used for Jowett competition cars, and this was certainly denied by Jowett engineers. The R4 engine employed the same camshaft profiles but the timing was rather different. 11.1. Hydraulic tappet camshafts have a cam base circle radius of 0.535”. They can only be identified by this measurement. This shaft can be used with solid tappets but may be noisy. 11.2. Solid tappet camshafts have a cam base circle radius of 0.5209". This shaft is much more likely to be encountered, but if in doubt, the base circle should be measured. Doubtless the engine would run if hydraulic tappets were fitted with the later camshaft but there is no factory recommendation that it would be suitable. 11.3. The R4 component is outside the scope of these notes. 11.4. Early camshafts, probably all hydraulic ones, originally had a spring loaded plunger (128) recessed in the forward end. This took the end thrust against a pad (120) pressed into the front timing cover (001). 11.5. Later camshafts, after Engine Number 23643 (some hydraulic camshafts were probably converted) had a fixed thrust peg in place of the spring loaded plunger. This peg carries oiling grooves and an oil way about 1/16" diameter drilled into the shaft cavity, where the plunger was formerly fitted, to meet up with a similar oil way drilled radially in the centre of the front camshaft bearing journal. 11.6. JCL literature implies that the replacement peg was an integral part of the camshaft. It seems to be invariably a separate peg which is an interference fit in the existing plunger recess. Earlier camshafts can be converted quite simply with no difficulty by accurately drilling the oil ways. NOTE: In Appendix III there is a drawing for the camshaft nose plug. It should be noted that this plug can only be used with the threaded adjustable peg, Part Number J54644, fitted into the front timing cover. 11.7. All hydraulic camshafts and other shafts fitted before Engine Number 19295 have a timing chain wheel the boss of which has three holes, two being for the attachment bolts and the third for a dowel. The position of the chainwheel in relation to the camshaft cannot be changed for valve timing. The camshaft also has two threaded holes and one dowel hole. 11.8. From Engine Number 19295 the timing wheel and the camshaft have provision for the two bolt holes, those in the wheel elongated. In addition, there are six off-set dowel holes which permit fine valve timing to be carried out using a vernier system. NOTE: The vernier style camshaft sprocket has a larger locking tab to cover the timing dowel. The dowel is also different, the vernier timing dowel has a smaller diameter stop to prevent the dowel from being pushed right through. The dowel’s stop should face the camshaft when the dowel is installed. See Technical Notes Series Part XII – Engine Assembly. 12.1 The early arrangement, up to Engine Number 10506, was a thrust pad against which the camshaft spring loaded plunger bore. This pad was a sliding fit in the timing case cover and end float in the camshaft was adjusted by removing the cover and fitting shims behind the pad inside the cover. On the outside the shaft of the pad was threaded and held in. place by a nut. The shaft was extended and carried a steady bar which, via a Metalastic bush was fixed on the bodywork apron. 12.2. After Engine Number 10506 the stay-bar was deleted, and the shaft of the thrust pad shortened but end float adjustment by shimming continued. 12.3. At some point, the end float was controlled by the introduction of a spring loaded thrust plunger (128 an 129) that bore against a thrust peg that was pressed into the front timing cover. It was not unknown for the plunger to stick in the camshaft, due to sludge build up, and cause a loud ‘knocking sound. 12.4. With the modification of the camshaft a modified thrust pad was fitted to the front timing cover. This entailed a threaded shaft of the pad and a tapped hole in the timing cover so that the end float could be adjusted from outside the cover by slackening off the lock nut and screwing the pad in or out. NOTE: THIS MUST NEVER BE CARRIED OUT WITH THE ENGINE RUNNING. 12.5. The variations in distributor flanges are mostly intended to cater for different models of distributor. No great ingenuity, is called for in mounting the different distributors. 13.0. Hydraulic tappets (cam followers) were fitted up to Engine Number 11901, solid tappets (215) thereafter. Both forms of tappet had minor and unimportant variations. It is important that, hydraulic tappets cannot necessarily replace solid tappets because of the provisions for oil supply in the crankcases designed for solid tappet use. 13.1. Hydraulic tappets are distinguished by the small cup which takes the push rod and the c1ear1y visible spring beneath it. Solid tappets have a solid bronze end cap with a larger cup for the push rod. 13.2. Push rods for the hydraulic tappets are about ½” shorter than those for solid tappets and the ball-end radius at the tappet end is much smaller. 13.3 It is generally agreed that the hydraulic tappets when working correctly are better than solid tappets. The engine is quieter and apparently more efficient. They are however not at all easy to maintain, prone to fail, and can cause low oil 'pressure at low idle. 13.4. Unless new hydraulic tappets are available and installed in a very good crankcase, as well as the appropriate push rods and camshaft, it is unlikely that they will be successful. 13.5. The bronze end cup of solid tappets varies in form. Early examples are similar to those illustrated in the Maintenance Manual, but later tappets have a funnel-like rim to assist removal of the tappet. NOTE 1: There were some Australian made tappets that were designed to utilize the original hydraulic type push rods. NOTE 2: The shrouded type of push rod seat (cup), was very likely introduced to prevent push rod dislodgement at times of valve bounce and/or flexing of the rods themselves. 14.0. Prior to Engine Number 16603 a Vokes full flow oil filter was fitted. This system had a filter container normally coloured green and relatively' long. It was housed in a short rear timing cover, siml1ar to that illustrated in the parts list (018). This housing did not include a by-pass valve, should the filter be blocked it by-passed by the filter element being forced away from its cork gasket seal. 14.1. After Engine Number 16603 a Tecalemit filter was fitted. This has a shorter filter canister, usually bronze in colour. The rear timing cover is longer than the Vokes type and it incorporates a separate by-pass valve. NOTE: Rear timing covers seem to vary somewhat and are not always a perfect fit on crankcases for which they were not originally intended. This can result in a failure of the difficult and vital gasket joint. Care should therefore be taken to keep these covers with their original crankcases. 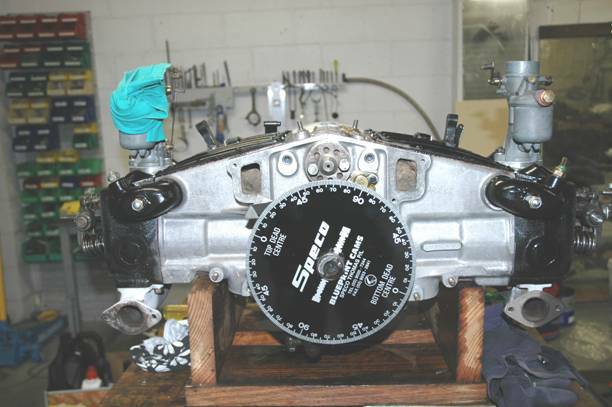 NOTE: For details of how to install a rear timing cover gasket, refer to Technical Notes Series Part X – Rear Timing Cover Gasket. 15.0. The cylinder head is designed so that a single casting can be used on both sides of the engine with very little modification (by changing the water transfer stud location). 15.1. With the early involvement of Javelins in competition JCL issued Competition Tuning Notes which advised on modifications to the cylinder head combustion chambers. In practice the company began to make changes gradually before the Jupiter style cylinder head was finally adopted for Javelins in late 1953. These heads were fitted to engines by Jowett Engineering Limited (JEL) after production had ceased, but earlier heads remained fitted to reconditioned engines also. 15.2. Figs 1 & 2 (Leaflet 4. Engine Rebuild) show the modification from the original head to the Jupiter head. 15.4. Early combustion chambers give a lower compression ratio which should enhance low speed torque, for some uses this may be thought desirable. 15.5. Early heads were fitted with the sheet metal shrouds and bakelite plug covers with rubber sealing rings. After early 1953 these covers were removed to fit a rather complex Lodge racing plug cover and a synthetic rubber sealing disc. Later still the original arrangement was re-instated. The parts for the Lodge system cannot now be obtained but other waterproof and more efficient plug covers can be obtained. For originality many prefer to retain the original bakelite covers which are still adequate, but also retain their original fallibility! 15.6. NOTE: No guidance can yet be given about the fitting of exhaust valve seat inserts for the use of unleaded petrol. 16.1. Valves from other sources have been available, where the valve head is welded to the stem. There have been many cases where the heads of these valves have parted and caused considerable damage. 16.2. Original inlet valves are Silicon Chrome Steel and exhaust valves are XB Austenitic Steel. NOTE: No guidance at this stage can be given about the changes which may need to be made to valves and valve guides for the use of unleaded petrol. Should springs depart materially from these lengths they should not be used. 16.4. The inner spring should be coiled in the opposite direction to the outer so as to reduce valve seat wear by ‘wind-up’. 16.5. Some owners have the inner spring omitted. There is no doubt that this can cause the valve spring collar to rotate and wear, with the result that the valve may drop into the cylinder. It is not therefore recommended that the inner spring be omitted. 17.0. Various casting differences are found but these have no significance. 17.1. It appears that the flywheel and clutch housings were machined with the crankcases. It appears that the oil seal (489) bore and the clutch shaft cover (591), locating the gearbox to some extent may not be properly in line with the crankcase if a housing from another engine is used. 17.2. The clutch lever ball pivot (517) is held by its cylindrical shaft in a hole fonmed'part1y by the clutch housing and the clutch shaft cover (591). The dimensions of the pivot shafts vary considerably and hence require the correct size of hole. 17.3. The later, Series III housing featured a tear drop shaped clutch fork opening. This change, from a rectangular opening, was made to prevent clutch fork rattle at low idle. 18.0. There were three variations in connecting rods. 18.1. In cases where it had been found necessary to grind the faces of the crankshaft webs, oversize connecting rods about 0.025” wider were available. These were painted red. They were not at all common but if available they should not be fitted to a crankshaft with crankpins of standard width. 18.2. Early connecting rods up to about Engine Number 10506 had a stepped joint between the rod and the cap. This arrangement has occasionally been found to fail, the ‘rocking’ of the cap fatiguing the big end bolts. If used the joint should be scrupulously cleaned of all burrs and damage especially around the bolt holes. 18.3. The stepped connecting rods were superseded by rods with a serrated joint. Again the joint needs careful attention. 18.4. The serrated connecting rods are slightly larger than the early ones and if fitted to an early crankcase should be checked for clearance in the crankcase. 18.5. Up to Engine Number 2200 the big end bolts (194) were 5/16" BSF. At this point the shank and thread diameter was changed to 3/8". 18.6. The change necessitated a big end bolt with 3/8" thread but retained the head of a 5/16" bolt. A standard 3/8"bolt will not fit. 18.7. The most common replacement big end bolt in current use is an "Unbrako" Cap Screw (high tensile). These need to have a broad chamfer machined on the head to provide clearance. Care needs to be taken to ensure adequate clearance in the crankcase. 18.8. Use of connecting rods fitted with the. 5/16" BSF bolts is not recommended. 18.9. Beware of fitting bolts which are too long. This would mean that the caps are not properly seated and the result would be disastrous. 18.10. Connecting rods and caps are manufactured in pairs. Every rod and its matching cap are marked with a two-letter code. Rods and caps which do not have a matching code must not be used. 18.11. It is not uncommon to find in works reconditioned engines, serrated connecting rods with both wide and narrow notches for bearing shell tangs. 18.12. Late style connecting rods had a wider stance reinforcement at the short side where the cap bolt screws into. Distance Between Bosses 30.00 29.00 ??.?? Note: Inside bearing diameter is usually 0.001” – 0.002” greater than shaft diameter. Note: Use J54824 with J54644 Adjustable Peg. Material for plug – Silver Steel (Hardened) or, 4140 Steel (Case Hardened). Counter-sink bore in plug for oil distribution. Contacting faces of adjustable peg and camshaft plug must have polished finish and lubricated prior to assembly. Use a smear of Nulon L90 Xtreme Pressure Anti Seize to provide initial lubrication. Do not make any adjustment to adjustable peg while engine is running. Severe damage to timing cover will result. To adjust, lightly screw in the adjustable peg until it just contacts the camshaft plug, slacken back not more than ⅛ of a turn and lock firmly with the lock nut.